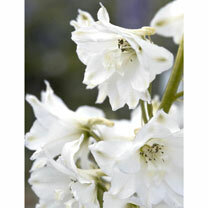 A vigorous growing pure white variety which will produce tall, sturdy spikes of classic delphinium blooms which is more compact than many giving excellent garden performance. Ideal for borders or even a large container on the patio. Flowers June-August. Height 75-90cm (2½-3'). Back of border variety. Supplied in a 9cm pot.